I’m talking about the Huffington Post (“Huff-n-Puff”) who went to DEFCON 4 as they strike out against business, again. This time round they demonize Harley-Davidson. The poster-child of everything that’s wrong with American business. Disregard the “mother of recessions”… they’re slammed as an irresponsible corporation for seeking profitability. OMG! Of all things…imagine an American company wanting to be profitable so they can continue to serve their customer base and shareholders. What’s the world coming too?! 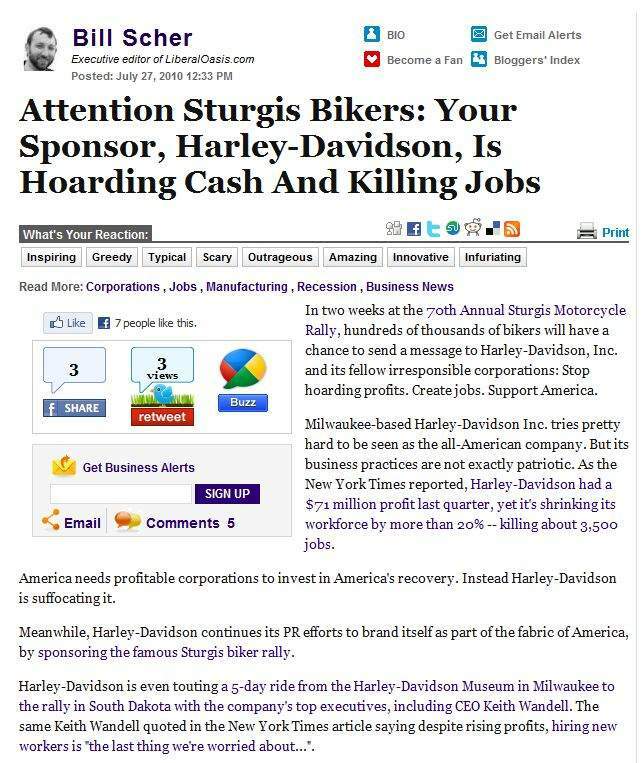 Then adding insult to injury they suggest that all motorcyclists heading to Sturgis need to send Harley a message – CREATE JOBS – independent of the new normal – just bolster hiring and production! Wear a “Jobs First” button, post YouTube videos… do anything and everything to send a message is their rally cry. Bill Scher, Executive editor of LiberalOasis.com wrote the scathing article and cites his partner news publication (a.k.a. NY Times) who reported that H-D had a $71M profit in Q2’10, yet continues to shrink its workforce. True enough. Many companies are focused on cost-cutting to keep profits growing, and in many cases the short term benefits are largely going to shareholders instead of the broader economy, as management needs to conserve cash rather than increase hiring and producing more product which isn’t selling. I don’t often rush to H-D’s defense and I’ve been critical of H-D focusing too much on cost-cutting to keep profits growing at the expense of innovation and new products. But Mr. Scher and his send ‘em a message drum beat are off tempo. Nowhere does he state that $60M of the $71M in profits for Q2’10 came from H-D’s financial services arm. The first time they’ve made money from this division in 2-years! He doesn’t discuss the union cost issues, the increasing state tax issues and the list goes on and on. Many have been reported on in this blog. Bottom line is that H-D is not irresponsible. For them to stay in business the next 100 years they have to resize to match the realities of the economy. It’s the “new normal.” Blame the housing bubble, the economy or the competition, but the fact is Harley-Davidson overall sales have fallen every quarter for 3 years. Yet, it’s fixed costs like infrastructure, commodities and rent remain the same. Clearly H-D has yet to crack the code of a successful industrial turnaround and have been in scramble mode. They need to continue shrinking the business to a size that’s defendable, and growing off that lower base, else they risk being restructured into oblivion. Sure I’m frustrated over the weak American economy, and angry at the lack of support for manufacturing in America. I’ll be one of the hundreds of thousands of bikers in Sturgis and will have a chance to send a strong message to Harley-Davidson. I plan to thank them for doing unnatural acts while trying to remain profitable so they can continue to serve their customer base. You and I! Then I’ll remind them they are behind on innovation. Mr. Scher I’ll be in Sturgis… wearing the “I Heart Harley” button. If you really want to help “win back America” consider purchasing a new 2011 Harley, ride it to South Dakota and spend some of that ‘how-to” book money at a Sturgis vendor booth. Photo courtesy of Huffington Post.